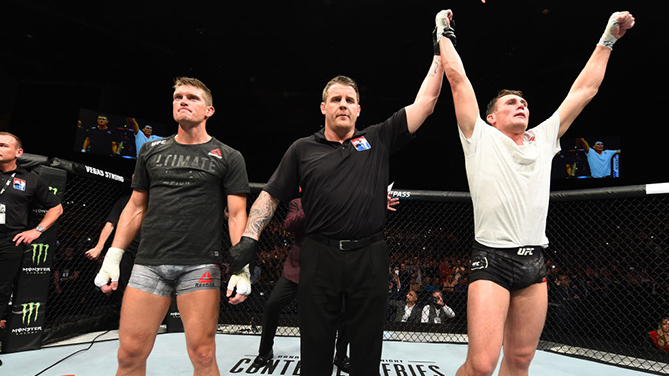 In the main event of the UFC’s first visit to Liverpool, the hometown hero emerged victorious, as Darren Till won a five-round unanimous decision over the number one-ranked welterweight contender, Stephen Thompson, in front of a packed house at Echo Arena. Scores were 48-47 and 49-46 twice for the No. 8-ranked Till, who missed weight for the bout at 174.5 pounds. The first round was a precursor for the rest of the bout, as it was a tactical war of nerves, full of feints and fakes from both men as they attempted to goad each other into a mistake. Thompson did land the higher volume of strikes, but none that put Till in trouble. With a little over two minutes left in round four, Till locked Thompson up for the first extended sequence of the fight, but outside of an elbow, he wasn’t able to do any serious work before Thomson got free, leading again to the tactical back and forth between the two. After the stalemate continued for nearly three minutes in round five, Till hit paydirt with a left hand with 2:04 remaining that dropped Thompson. Till scrambled for the finish, but Thompson found his way back to his feet and landed a hard left of his own with less than 90 seconds left. Thompson proceeded to score a brief takedown as he tried to finish strong, but Till rose immediately and went back to stalking until the final horn.